It’s called sweating. Your car battery is covered with drops and eventually it turns to a hard substance. What is it and what are you supposed to do about it? Don’t panic. These guidelines will help you. So here are the facts to know when your car battery is leaking from the top. Is a sweating battery dangerous? Is it normal that new batteries leak? Why is your battery leaking? The short answer is yes. Below you’ll see many reasons for a battery’s leaking. Some circumstances are vital to tend to. Firstly, you don’t want your car to suffer damage, right? But your own safety is also important. Don’t get stranded beside the road and don’t let an electric problem cause hazards in your garage. New batteries aren’t supposed to leak, but accidental tipping can cause it. It should subside eventually as the liquids settle again. If it continues, your battery is probably faulty and you should exchange it. 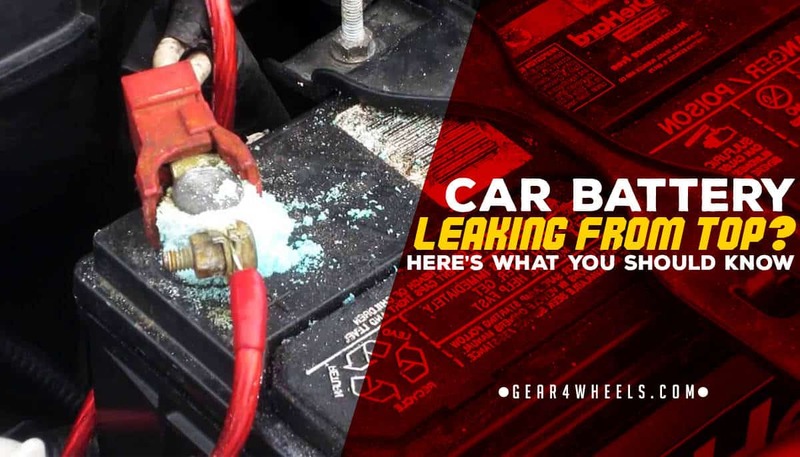 ​WHY DO CAR BATTERIES LEAK ACID? ​When a car battery leaks acid, it is usually through the cell caps on the top of the battery, or due to damage to the body. 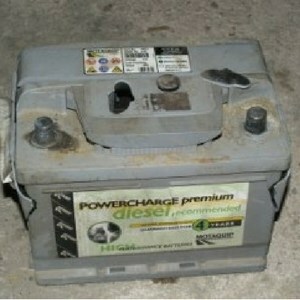 Overcharging your car’s battery is another reason for leakage. Smart battery chargers detect and give signals to show when a battery is charged to full capacity to avoid this. Your alternator connects with your battery and determines the number of volts—amount of power—that is generated. But the alternator and specifically the regulator can malfunction. When too much power is sent through, it can cause rapid charging. This will make the liquid inside the battery—water and acid—bubble and exit the unit. This same liquid needs to be monitored well. New batteries rarely require filling up, but occasionally it can be necessary. Older batteries need regular replenishment of distilled water. Don’t add acid as you may impair the battery’s functioning. Whenever filling up is required, you risk of letting the chambers overflow. Follow directions and if you did add too much, tip out the excess. Luckily, this problem can easily be fixed and it shouldn’t damage the battery. The only risk is corrosion of the exterior parts if the acid or water lies on top for too long. Check your battery regularly so you can clean it when necessary. Heat can make your battery parts expand. Though this is a rare occurrence it can push liquid out of the battery. Of course, these changes mean your battery might now be damaged. It’s best to replace it. Batteries should be kept upright. When you tip one you can cause liquid to escape. A battery’s chambers can’t be completely sealed because the chemical reactions produce hydrogen gas. This will cause pressure in the battery. For this reason, each battery has vents. Tipping is not a dire problem. A few drops that escape won’t affect the battery’s functioning too much. You can also remedy the problem by adding distilled water. The liquid can purely bubble out because of cracks in the casing. This could be because of pressure building inside or driving over rough terrain. Debris or excessive shaking inside the engine can cause cracks. It’s uncommon but possible. This is one of the reasons you must regularly check the inside of your engine. A number of problems can occur and you may not know until it’s too late. 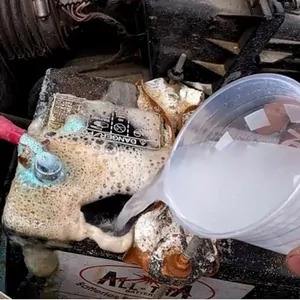 Here’s another cause that’s not very likely, but you never know how the weather’s going to turn, and the liquid in your battery can freeze in excessive cold. Freezing means expansion. The contents of the battery will press the casing’s sides outward, and this creates pressure on the cells. Now you have leaking cells and you’ll know about it when you see the sweating battery. It’s better to pick up on this problem before it gets to this point. You definitely don’t want to handle this problem beside the road. If you realize the temperature has dropped considerably overnight, it’s best to check your battery before your next trip. Here's a good selection of winter batteries. Check it out! There’s a reason batteries are sold with limited warrantees and guarantees. Even though you can maintain a battery by adding more fluid they’re not designed to last forever. A battery’s performance should guide you as to when you replace one, but after four or five years, you’re driving with a very unreliable engine part. It can cause problems at any moment and leaking is one of them. Thank you. I’m getting a new battery asap.